We just returned from our traditional Labor Day weekend trip to the lake. The weather was some of the nicest we’ve had all year, including a day and a half of some much-needed rain. Grandma and Grandpa were there to help out, which we really appreciate when chasing after all three little ones. Our 3-year old had a wonderful time (and cried when we left). It was a great weekend with one hitch: both of our twins were teething. Teething seems to affect babies differently, and sometimes the signs are difficult to recognize. Our babies cut their first teeth between 3-7 months of age. The first few teeth are easier to detect because your baby’s gums are largely smooth, and it’s easy to see new teeth coming in. But the major symptoms of teething are somewhat nonspecific. The fussiness level varies widely among babies, but every baby seems to have a baseline, described as when and why they tend to fuss, and how loud or how long it gets. With our twins, we have one boy on the low end of the fussy scale, and one on the high end. Once you get used to your baby’s baseline, it’s easier to notice when he or she seems especially fussy throughout the day and multiple days in a row. For the low-end twin, almost any crankiness that persists for a day or longer is a sign of something wrong. For the already-fussy twin, it’s more like he’s being tortured by invisible monkeys at every possible instant. We notice it most when the babies should otherwise be happy – when they’re fed, rested, and have a favorite toy in hand. One or more teeth coming in creates sensitive, swollen gums. As a result, babies don’t seem to enjoy eating as much as they normally do. They turn away from the bottle, even when they’re clearly hungry. You might notice that your little one will drink (or nurse) for a bit, then pull off and cry a bit, then drink some more as hunger takes over. This process repeats over and over until the hunger isn’t enough to drive past the discomfort. Our twins, at 15 months, are eating solid table foods regularly. When they have a tooth coming in, they refuse to eat even their favorite snack foods. That’s when we know that there’s a real problem: a clearly hungry baby that can’t make himself (or herself) eat. Perhaps worst of all, a baby that regularly takes the pacifier will continually spit it out. This is especially frustrating at night when a pacifier is the last crucial part of the bedtime routine. People. Specifically, they bite parents and even grandparents who happen to be holding them. Usually they like to bite the soft part of the shoulder. They also enjoy pulling my hand to their mouth to chomp on it. And watch out! When they have a lot of teeth, it hurts. Toys. Things made of wood (puzzle pieces, blocks) or soft plastic (dolls, bath toys) seem to be the most popular targets. Soft things. Blankets, clothes, socks, and stuffed animals are chewed on constantly. Most of these things can taken, but the Aden+Anais blankets recently started to suffer. Second, and you’ll probably have noticed this already, teething babies aren’t usually trying to taste or eat these things. They’re gnawing on it because it feels good, and they’ll do so even if not hungry. We have noticed other symptoms occasionally that seem related to teething: drooling, runny nose, etc. But the biting things, fussiness, and refusal to eat or drink are the front runners. Really, the true test is to wash your hands really well, and then feel the gums with your fingers. Often you can see and feel a new tooth coming in, and you can sense the swollen gums. Baby teethers. There are plenty of bright, colorful baby teething toys out there. Some you keep in the refrigerator or freezer to provide a cool soothing sensation when your baby chews on them. Others are just chewable all the time. 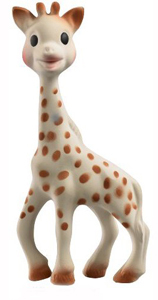 Sophie the Giraffe is one of our favorites. Find one that your baby likes and stick with it! Teething necklaces. The latest thing in baby gear is a stylish necklace that doubles as a portable [emergency] baby teether for your little one. These are handy if you’re out and about, or simply want nicer jewelry spared from your baby’s little chompers. Cold, chewy foods. Frozen waffles and refrigerated bagels seem to offer the chewiness and the cold that soothe baby’s gums. A pacifier rinsed in cold water. This proved a useful trick for our boys when they woke up [crying] in pain from teething. 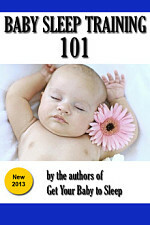 The cool, wet, soft touch of the pacifier soothed them back to sleep on a couple of occasions. Baby Orajel or infant pain reliever. Consult your pediatrician, first, but there are pharmaceutical solutions. Orajel for temporary topical pain relief, and baby Advil if the pain is pretty bad.